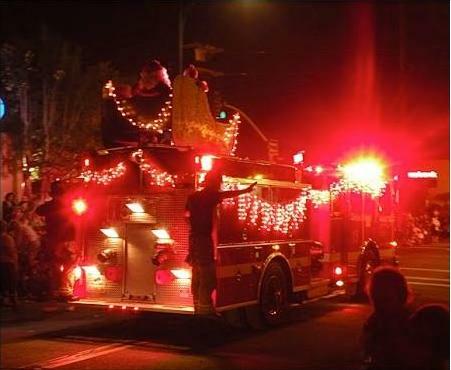 Santa on top the fire truck.Photo by Todd and Tabitha Barry. Forget Santa, I Met Michelle Obama and the President for Christmas! 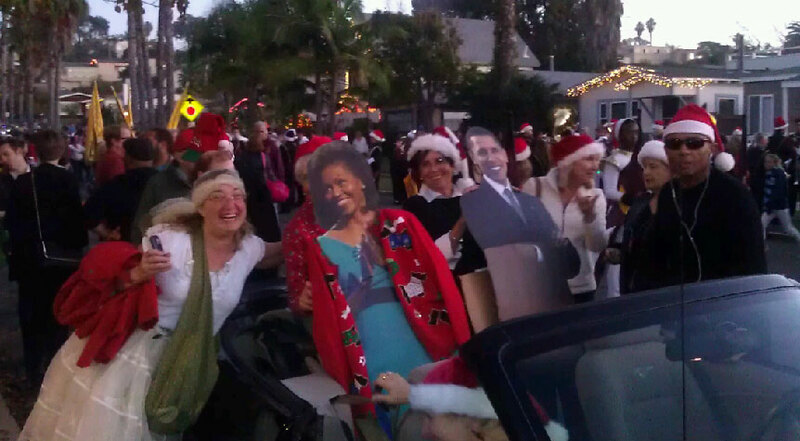 Brenda McFarlane (left) meets the first lady at the Ocean Beach Christmas parade. 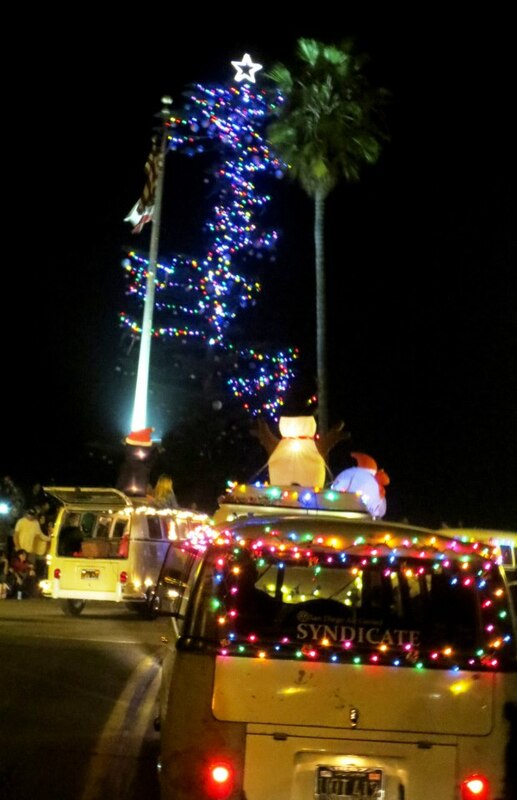 I couldn’t want much else for Christmas than what I got in the November election but for me, the OB Parade was that extra gift in my stocking. 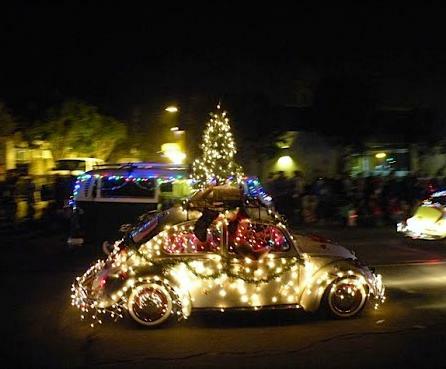 Of course, the parade is always one of the highlights of my season but this year’s parade was better than ever for me. So I put on my finest white angel outfit and donned the wings supplied. With my friend Karen and other supporters, we followed our fearless leader Clairemarie and the Amnesty International decorated truck with the beautifully rendered large paper-mache replicas of Ghandhi and Martin Luther King. The giant puppets were made by Antonia Davis and the San Diego Puppet Insurgency. These were manned by two stalwart Amnesty International supporters. What an honor to be a part of the parade and to act on behalf of such a great organization. Last year, I loved watching the parade and clapping for anything and everything. This year, I got all that back in bushels. The crowd, which started gearing up and saving places in front early, was incredibly fun and supportive. I felt like a beauty pageant winner performing incredible feats of daring-do as our small group of angels performed simple movements to impress the crowd. What is so lovely about the parade as it feels like I imagine a small town parade would feel like. For one brief moment, there seems to be no cynicism and people put aside their “go ahead and just try to impress me” attitudes for a moment and just enjoy the simple sharing of a simple event. After we got to the end, we rushed back and joined the fun with the rest of the appreciative parade goers. I’ve got to admit, the Sunset Cliffs Dogs are always my favorite participants. 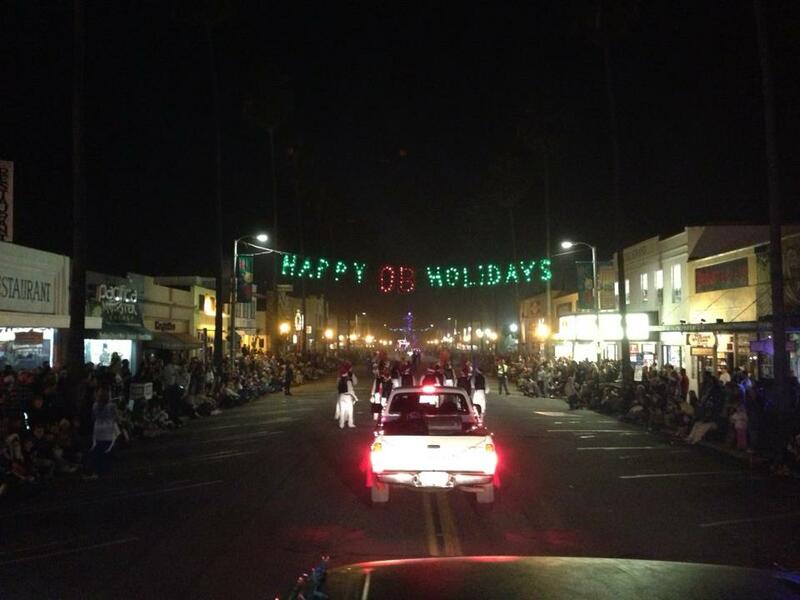 I’m always impressed by how active the OB Historical Society is in our community and the parade was no exception. I especially enjoyed the music, including the drummers and the Scottish band. Oh what fun it is to live in Ocean Beach! Photo by Todd and Tabitha Barry. 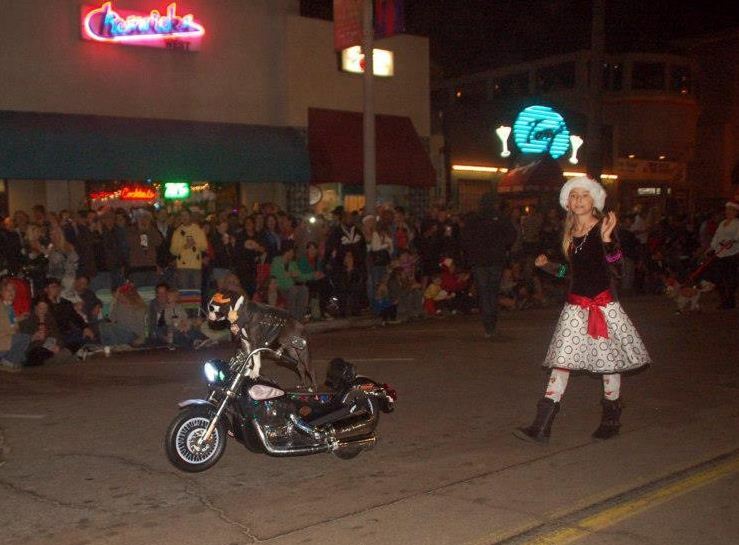 “Chopper the Biker Dog” and his friend Chloe. From Lou Guidi. Anyhow, we made an appeal for photos – and here’s what we have so far – and we will keep adding new ones sent to us via our email throughout this coming week. If the expression “on the fritz” weren’t older than all of my friends, I’d attest that it was a tribute to my good buddy Casey Fritzsching, who spent some of his formative years in OB and is one of the biggest klutzes I know (though he somehow manages to tend bar like a madman at a high-end restaurant in La Jolla these days). One time in a 12 hour span he managed to drop and shatter a giant bottle of vodka while helping me unload groceries, light two pounds of carne asada on fire, break a martini glass and a glass shaker (separate incidents) and flush his phone down the toilet (not drop it, flush it – this was before the day of smartphones or it probably wouldn’t have fit down the hole). The parade was a blast, as always. I was too busy herding cats (junior pee-wee football cheerleaders) to shoot photos, but I did get a kick out of all of the kids that had trick-or-treat bags out that were loading up like it was a second Halloween where all of the treat sources offered delivery. Some new photos have been added – check them out.